For a dungeon master, there's little better than a golem to patrol through your halls. You can just give 'em a simple command and know they'll go take care of it. There's relatively little upkeep. You don't have to worry about them getting lippy with you. They're great. 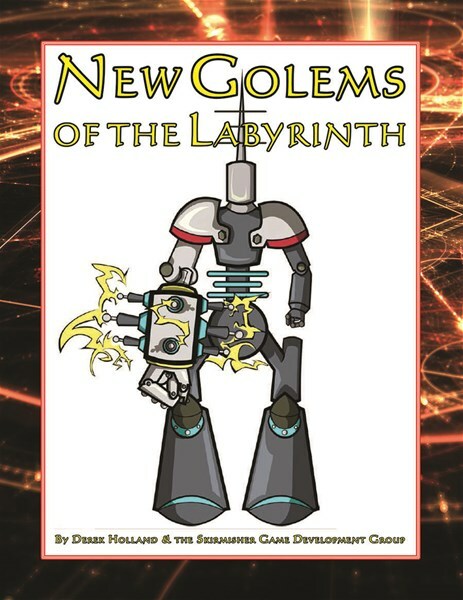 Skirmisher Publishing has released New Golems of the Labyrinth that's a sourcebook with new golems that you can populate your dungeons with. Of all the creatures found guarding hoards of lost treasure, Golems — constructs created by powerful spell casters from specific sorts of materials — are among the most interesting and dangerous. Some might even constitute treasure in and of themselves. Golems crafted from materials like clay, flesh, stone, iron, amber, bone, bronze, and wood are familiar to the players of OGL-based games, but they represent just a narrow glimpse of the possibilities for such creatures. This mini-sourcebook contains 10 new sorts of Golems, all of them are very different from the basic models and some of them pretty weird, that GMs may find useful in making their campaigns more interesting and unpredictable. They include the Cerebral, Ectoplasm, Flesh-and-Blood, Gas Metal, Leaf, Lightning Rod, Magic, Particulate, Shield, and Water Chariot Golems. “New Golems of the Labyrinth” also comes with four Cardstock CharactersTM miniatures that storytellers can use in their tabletop games. Monsters in this publication are stat'ed for the "Basic" version of the OGL system and can easily be modified or used as-is with any related games. It was written by prolific game developer Derek Holland and illustrated by artist Phillippe St. Gerard.